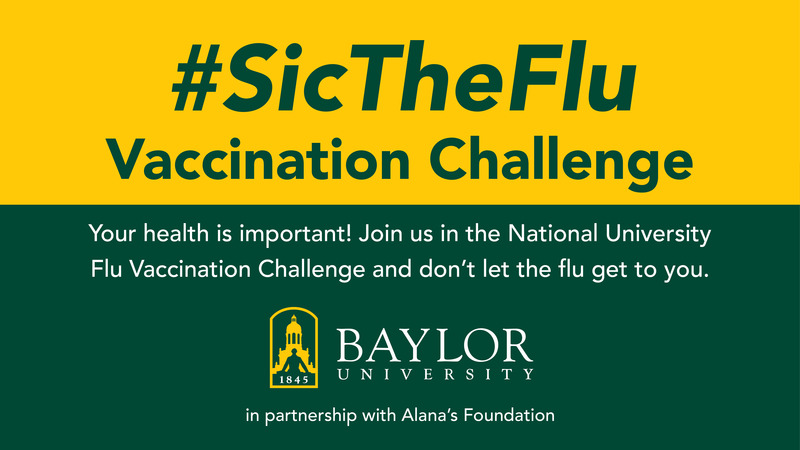 WACO, Texas (Oct. 8, 2018) – With flu season approaching, Baylor University has joined the Alana Yaksich National College/University Flu Vaccination Challenge to encourage students, faculty, staff and alumni to protect themselves – and others – from the contagious respiratory illness by getting a flu vaccination. Baylor students, faculty, staff and alumni who get the flu vaccine – whether they get the flu shot at a campus clinic or their doctor’s office – are eligible to fill out a brief online survey to be counted by Baylor as part of the competition to increase vaccination rates, especially among the college-aged population. Baylor is among 14 universities in the medium-sized category (10,001 to 25,000 students) taking part in the challenge. (Current standings among the participating universities are available here.) The institution with the greatest number of surveys completed will be presented later this year with the Alana Yaksich Memorial Trophy. The Centers for Disease Control and Prevention (CDC) recommends a yearly flu vaccine as the first and most important step in protecting against influenza and its potentially serious complications. A study by the National Foundation for Infectious Diseases shows that approximately one quarter of college students get the vaccine. On college campuses, influenza viruses are known to circulate rapidly, through constant exposure in close quarters like common living spaces, classrooms and social activities. In addition, lack of sleep, healthy eating habits and regular exercise can weaken the immune system, making young adults more vulnerable to the flu, Stern said. After getting a flu shot, people can protect themselves further through proper hygiene, including frequent hand washing or use of alcohol-based hand sanitizers, covering coughs and sneezes, and staying away from sick individuals. Alana’s Foundation was founded in 2003 in memory of 5-year-old Alana Yaksich, who died from influenza. In 2009, Alana’s family established Alana's Foundation, a nonprofit dedicated to educating people about the severity of influenza and the importance of yearly flu vaccination for children and adults alike, as well as provide support for families who have lost a child. In 2014, Alana's Foundation partnered with the Michigan Department of Health and Human Services for the inaugural College and University Flu Vaccination Challenge to increase flu vaccination rates among college students in Michigan. In 2017, Alana's Foundation launched a National College/University challenge due to the success of the Michigan Challenge. Baylor University is a private Christian University and a nationally ranked research institution. The University provides a vibrant campus community for more than 17,000 students by blending interdisciplinary research with an international reputation for educational excellence and a faculty commitment to teaching and scholarship. Chartered in 1845 by the Republic of Texas through the efforts of Baptist pioneers, Baylor is the oldest continually operating University in Texas. Located in Waco, Baylor welcomes students from all 50 states and more than 80 countries to study a broad range of degrees among its 12 nationally recognized academic divisions. Looking for more news from Baylor University?